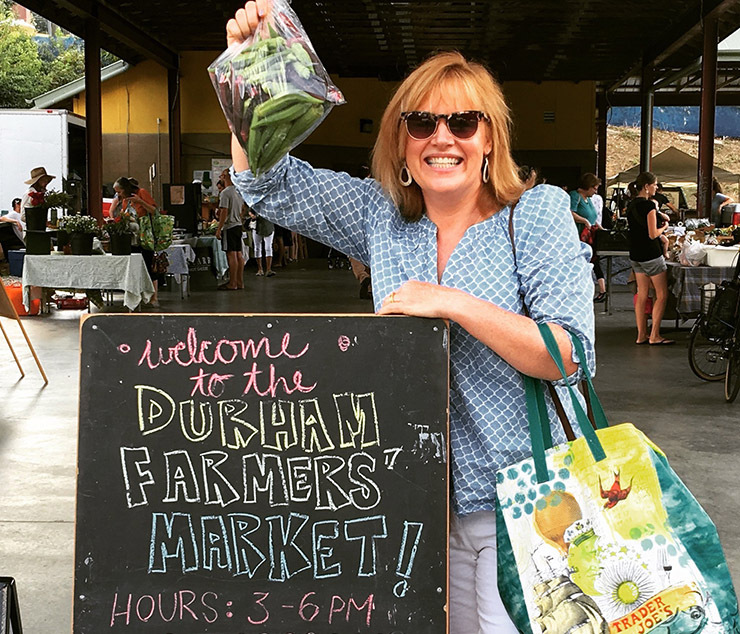 One of the first things I did after my recent move to North Carolina was go to the farmers market in the center of Durham. Yoga on the grass, visiting chefs, food trucks, and local organic food (including lots of produce, raw honey, barnyard eggs, grass-fed meat and cheese) were all there to welcome me into this smaller yet trendy city. On a recent visit a couple of weeks, ago I saw loads of okra. Yes, lots of green and purple okra everywhere. 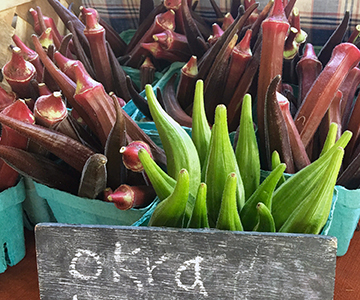 I hadn’t thought about okra since a gumbo cooking class in New Orleans several years ago. I was admittedly turned off by okra’s sliminess during that class, even though I enjoyed the resulting gumbo. I had always enjoyed the fried okra I tried while growing up in Dallas, but I don’t get too excited about deep fried foods in general, so that didn’t encourage me to add okra to my diet. But here I was, a foodie dietitian, surrounded by fresh local green and purple okra. I had to give okra another chance to finally be part of my life! I mean, think about the powerful anthocyanins in the purple okra. How could I walk past those fresh babies? Roasting vegetables is the best way to bring out a sweet, caramelized flavor while offering a tempting texture, so there I was in the kitchen the next day, tossing the washed okra with high-heat olive oil, salt, and pepper, and tossing them in a hot oven at 450 degrees F. After 15 minutes, the okra was nicely browned and ready to eat. I took a couple of pictures while they cooled and sat down for my okra experience. And what an experience it was. It was simple, healthy, organic, local, and delicious, with a great texture that wasn’t slimy at all. Particularly high in vitamins C and K and manganese, and rich in fiber, protein (especially for a vegetable), choline (a nutrient we just don’t get enough of), folate, vitamins B6, B1 and A, calcium, and magnesium, okra makes its way further into my somewhat Southern nutritionist heart. 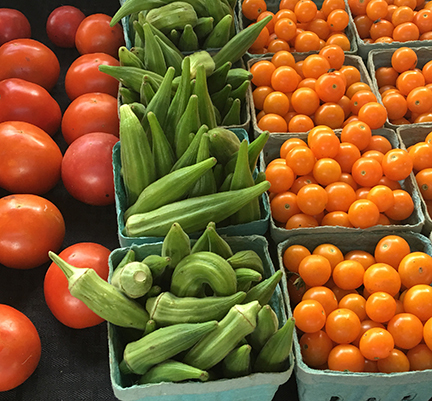 Okra doesn’t disappoint me with its phytonutrients either; high in xanthin, beta-carotene, glutathione, zeaxanthin, and lutein, these finger-like vegetables help boost the immune system and fight disease. Purple okra are also full of powerful anthocyanins, making okra even more nutritious and health-promoting. The sticky stuff that I noticed when I cut the okra appears to be one of its best health features. It’s the very thing that helps ease passing waste from the body and protects the intestinal tract from irritation that can occur with harsher foods, like wheat bran. This slimy substance also binds toxins and excess cholesterol to carry them out of the body. It may even help control blood sugars. Fortunately, we can take advantage of this sticky stuff in okra, without that undesirable texture while eating it. 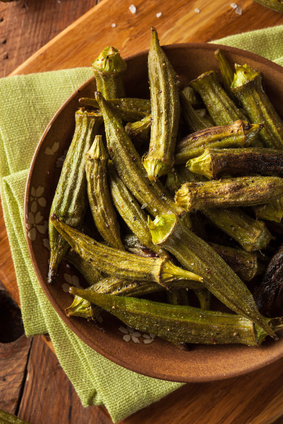 For a nutritious alternative to fried okra, try tossing sliced okra with a high-heat olive oil and then tossing with corn meal, pepper, and salt. Allow the okra to sit for about 10 minutes, then bake single layered on a pan for about 20 minutes at 425 degrees F. Flip at least once while it is baking. Besides just the Southern part of the United States, many areas of the world including India, Africa, and the Middle East have been enjoying okra for centuries. Join us by adding okra to your food repertoire and take September’s Healthy Challenge. Enjoy y’all! It feels like the holidays start the day after Halloween! Fortunately, the holidays are accompanied with all sorts of yummy treats and festive foods. One particularly aromatic spice that brings in holiday cheer is nutmeg. Avocados are a delicious and healthy fat source loaded with nutrition, and they help the body absorb more nutrients from other healthy foods. Take this month's Healthy Challenge and replace unhealthy fats in your diet with avocados. Add nutrition along with a great taste and you'll get a healthy feeling of satisfaction.